WE ARE CLOSED FOR THE SEASON. Thank you to all of our 2018 visitors. We hope to see you next year! We will reopen Wednesday, May 1, 2019. ***Weekly discounts are available. Two week stay limit for rv sites. One week stay limit for group camp site. Guest must be out of the RV park for one week before they can re-book a site. 30 AMP Service ONLY. Due to the limited capacity of our tanks, non-guests are not permitted to utilize the dump station. Sites 3 & 4 (foreground) & sites 12 & 13 in front of bath house. RV Site with electric ONLY. 20 feet max rigs. 1 week max stay. The Gateway RV Park offers a number of wonderful amenities including FREE WiFi, newly remodeled bathrooms (the women's bathroom has two toilet stalls and two showers including one ADA accessible one; the men's bathroom has one toilet stall and two showers including one ADA accessible one), fire rings, pet friendly and picnic tables at each camp site. We ask that you keep your pet on leash at all times and clean up after your pet. The park is nestled into a perfect location in the Roaring Fork Valley, along the Roaring Fork River with numerous area attractions to see. There is easy nearby walking access to the Roaring Fork Transportation Authority (RFTA) bus transit system that runs between Glenwood Springs and Aspen, serving Carbondale in-between. 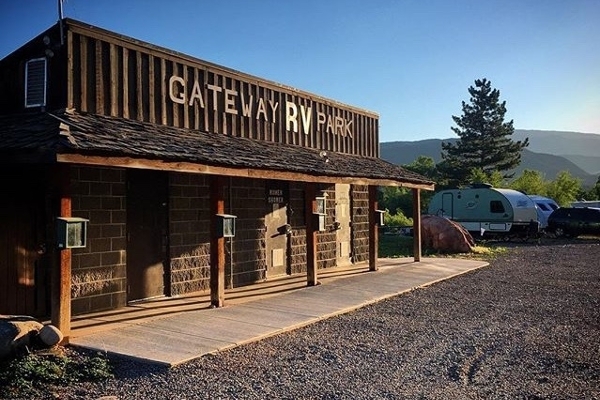 The Gateway RV Park is a short 20 minute walk to the historic downtown Carbondale business district which is renowned valley-wide for its restaurant culinary cuisine, art galleries, theater venues, and performing arts scene.If you want to venture out of town, head up valley to Basalt, Snowmass, and Aspen. There are 17 RV Sites and one small Group Tent area. Each RV Site has 30 AMP electrical service with a double 110-volt outlet and FREE WiFi. Propane is not available at the park. Check out time is 11am; check-in time is 1pm. The park is nestled into a perfect location along the Roaring Fork River, known for its gold medal fishing, with numerous area attractions. There is easy nearby walking access to the Roaring Fork Transportation Authority (RFTA) bus transit system that runs between Glenwood Springs and Aspen, serving Carbondale in-between. It is a short 20 minute walk to historic downtown Carbondale, which is renowned valley-wide for its restaurant culinary cuisine, art galleries, theater venues and performing arts scene. The Rio Grande Bike Trail provides 44 miles of continuous trails from Glenwood Springs to Aspen. 1. Campground fees are payable at registration. Check-in time is 1pm. Check out time is 11am. Please check out or re-register with Camp Host on duty before 11am (subject to availability). CANCELLATION POLICY: The Carbondale Recreation Department and the Gateway RV Park has a 48 hour cancellation policy for all programs and facility reservations. Failure to give 48 hours’ notice will result in a non-refund of your reservation fee for the Gateway RV Park. Cancellations made prior to 48 hours will result in a full refund minus a $10 administration fee. The refund check will be processed through the Town of Carbondale Finance Department (this may take up to three weeks) and sent to the address on file. Checks returned for insufficient funds will be assessed a $20 processing fee. 2. There is a 2-week maximum stay for all RV sites 24 ft and above and a 1-week maximum stay for the group tent site and 20 ft max RV sites. In order to re-book, you must vacate the RV Park for at least 1 week before you may stay again. 3. Quiet Hours are 10pm to 7am and are strictly enforced. 4. Generators are not to be used in the campground unless there is a power failure. Please respect your neighbors. 6. RV Sites may only have 1 RV per site, and tents are only allowed in the group tent site. 7. Maximum 6 guests per site. 8. Keep campsites free of debris. Dispose of trash in the dumpster located at the entrance to the park. 9. The speed limit within the campground is 5 mph. 10. Proper sewer fittings are mandatory for sewer hookups. 11. Campfires are allowed in fire rings only. Fires to be no more than 2 feet high and MUST BE OUT BY MIDNIGHT! 12. Music and loud noise or disturbances are not allowed. Please, out of courtesy to other campers, keep the noise down. 13. No smoking in the bathroom areas. 15. Any vehicle parked in violation of these Rules and Regulations, or in violation of signs posted throughout the Park, may be towed from the Park at the expense of the vehicle’s owner. 16. Any person who fails to comply with any of the above rules will be subject to verbal warnings for minor infractions and/or removal from the park for repeated or major infractions (no refunds will be issued). 17. If you will be arriving later than 8pm, please inform the camp host as a courtesy. 18. If you plan to vacate the park prior to the end of your reservation, please inform the camp host on duty. 19. Camp hosts will do their best to honor site requests, but please understand this may be subject to change. 20. If you book an RV site that is smaller than your rig, you will be moved to an appropriate-sized site if available, and if not available, you will be asked to leave the park and be charged a cancellation fee. Due to the limited capacity of our tanks at the park, non-guests will no longer be permitted to utilize the dump station. The Gateway RV Park is unable to accept any US Mail, UPS packages or Fed Ex deliveries. Fireworks, aerial unmanned drones, model aircraft, and rockets are prohibited in the Gateway RV Park, unless Town approved with permission expressly granted. Since we are located within 5 miles of an airport, your aerial unmanned drone flight would also need permission granted by the Air Traffic Controller.